Carpenter ants may be one of the most valuable insects we have on earth. They chew up tons of wood and turn it into fine sawdust that rots, providing compost for new environmental growth. However, when they enter man-made structures they are considered a highly destructive yet common pest. Got Carpenter Ants? Call a knowledgeable licensed professional at 1-800-323-PEST or contact us to request a FREE Quote, ask us a question or Schedule a Service! As is the case with termites, carpenter ant infestations often go unnoticed until it is a costly situation to correct. The damage caused by carpenter ants is distinct although it is often confused with termite damage. 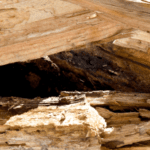 While termites feed on the cellulose found in the wood, carpenter ants excavate galleries or tunnels in decaying wood. Contrary to popular belief, carpenter ants do not actually eat the wood. Rather, they hollow it out in order to nest inside, which may result in structural damage. Also unlike termites, carpenter ants generally take years to cause significant damage. 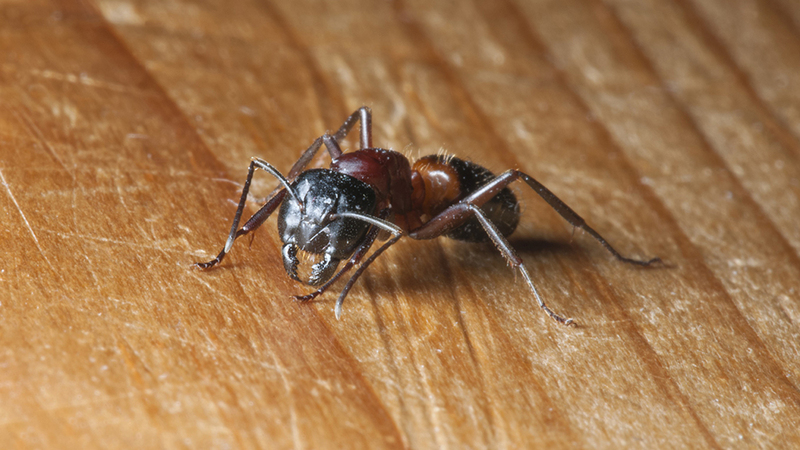 A carpenter ant infestation within a building usually means that there is a moisture problem. For instance, these critters are often found around dishwashers, sinks, laundry areas, and bathrooms – especially where plumbing leaks. Taking care of the source of that moisture makes the structure less attractive to the ants. 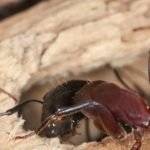 Carpenter ants can infest building materials such as wood or foam insulation and can occupy cavities like those found in hollow doors or window frames. It’s important to note that since they usually feed on dead foliage and other insects, the ants may be living outside yet foraging indoors for food scraps or moisture. The first step in resolving a carpenter ant infestation is to locate the nest. The best indicator will be areas where you find the sawdust that is created when the ants dig out their tunnels. Depending on where the nest is located, you may simply be able to remove it. If not, you can still remove the ants from the nest with a vacuum cleaner. Afterwards, make sure to dispose of the bag in order to prevent the ants from getting loose and returning. Also, keep in mind that a mature nest may have satellite nests located nearby, which will need to be found and destroyed as well in order to properly resolve the infestation. Pest management professionals will often routinely treat the exterior perimeter of the building in order to control a nest or protect the structure from carpenter ant foraging. This process of drilling and treating can be highly effective if nests are able to be pinpointed. Keep in mind that the materials used can only be applied by a trained pest management professional. To properly resolve a carpenter ant infestation requires residual insecticides and void injections of insecticide. This treatment typically requires all occupants and pets to vacate the building for a given period of time. 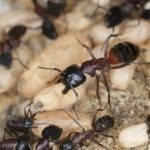 When a carpenter ant infestation is suspected, it’s always best to employ a licensed pest management professional, especially when nests are difficult to find. The company should conduct a thorough and complete inspection that provides you with the location of the nest(s) or at least a probable nest site prior to treatment. Locating the nest is not always easy, so practice patience. However, as long as all nests are found and treated, it is unlikely that additional services for carpenter ant control will be needed. If you’re having issues with carpenter ants, contact the pros at Modern Pest Services for a FREE quote! Or call us at 1-888-997-3312.